Baby birds can do arithmetic, say researchers in Italy. 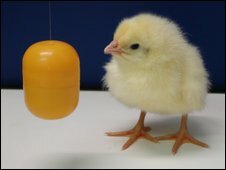 Scientists from the universities of Padova and Trento demonstrated chicks' ability to add and subtract objects as they were moved behind two screens. Lucia Regolin, an author of the study said the animals "performed basic arithmetic" to work out which screen concealed the larger group of objects. The findings are reported in the journal Proceedings of the Royal Society B.
Chicks always try to stay close to objects they are reared with - just as they stay close to and follow their mother as soon as they hatch. This instant recognition is known as "imprinting". 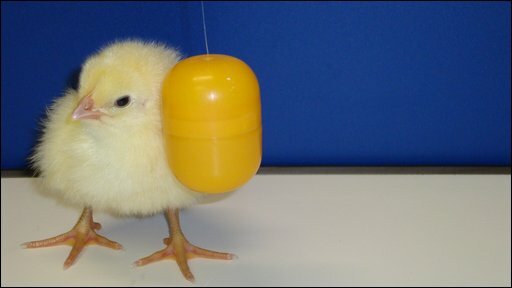 "We had already found that the chicks have a tendency to approach a group containing more of these familiar objects," explained Professor Regolin, who studies animal behaviour at the University of Padova. She and her team were able to test the birds' numerical skills as they followed the objects - which, in this instance, were small plastic balls. "We used the little plastic containers you get inside Kinder eggs and suspended them from fishing line," Professor Regolin told BBC News. "We made these balls 'disappear' by moving them behind the screens one at a time." 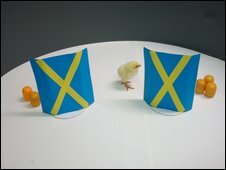 In each of the mini maths tests, a chick watched from a clear-fronted holding box while one of the researchers slowly moved the balls behind the screens - three behind one screen and two behind the other. The front door of the box was then opened, releasing the chick into the tiny arena, so it could walk around and select a screen to look behind. "The chicks still approached the larger of the two groups first, even though they had to rely on memory to work out which screen to choose," said Professor Regolin. Swapping the objects from one screen to another didn't fool the maths-performing chicks. "In a further experiment, once we had hidden the balls behind each screen, we transferred some of them from one to the other," Professor Regolin explained. The birds, she said, were able to "count" the balls that were moved to work out which screen hid the larger set at the end of the transfer. "They still chose correctly - adding up the numbers based on groups of objects they couldn't see at that moment." It is already known that many non-human primates and monkeys can count, and even domestic dogs have been found to be capable of simple additions. But this is the first time the ability has been seen in such young animals, and with no prior training.